Please refer to our stock # 2925/4947 when inquiring. 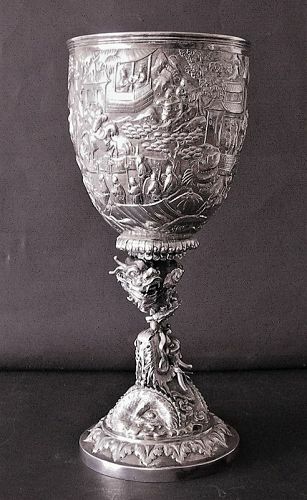 A Chinese silver goblet of monumental size and magnificent craftsmanship, the cup with a diameter of 12.8 cm is chased and embossed with a continuous scene of numerous foot soldiers, warriors on horesback and courtiers in pavilions- all against a dense background of trees, mountains and pagodas. The stem is applied with finely cast dragons, showing minute details of face and skin. This is a rare and singular example of Chinese silversmith's art in the 19th C, standing at a lofty height of 29 cm and the weight of 765 gm. The inside of the foot bears the inscription " MALLETT, BATH, ORIENTAL JEWLLERY & FINE SILVER". This was a reputable retailer based in the city of Bath. Francis Mallett founded the Company around 1860 , it prospered and moved to London's Bond Street , becoming a world famous dealership. Condition: Good, no repair is detected the embossing in fine and sharp condition, there is perhaps a small tail element on the stem missing from the terminal of the tightly coiled upper dragon. With the lower part of the dragon, the jagged ends of the manes on one side of one antler is missing. These are very tiny missings which do not detract from the beauty of the goblet.